I Have a Serious Liver Condition are Your Products Suitable for Me? One thing all healthcare professionals will agree upon, especially if you're suffering from a serious liver condition is to immediately stay away from all the things that you know are bad for you, such as alcohol, smoke and unhealthy foods etc. The number one advice is to eat more healthy... especially fruits and green dense vegetables that are good for your liver, and to keep up with this new habit every-single-day. Our 100% natural products not only contain healthy foods that are good for you, but each and every single Super-food contained in our products have a specific benefit for your liver. So yes our products are suitable for you, if you think you may be allergic to any ingredient contained within a product or still unsure please double check with your doctor prior to taking. Is it really true that the Liver can Re-Generate itself fully? Scientific studies prove that the liver is the only organ in the entire body that is capable of re-generating itself fully...click here to read an interesting article on wikipedia with credible references. This does depend upon the level of liver damage. Some experts say re-generation can start to occur from as little as 25% others say even less but no-one really knows the exact percentage. This awakens hope that no matter what the current condition of your liver right now... that there is hope, especially if you immediately start to care for and look after your liver starting today, you can do this by staying away from vices and start nourishing your Liver using the right nutrients, vitamins and aminos. Click here for a list of foods that are good for your liver. Can your products help me with my Gallbladder? I have had my Gallbladder taken out, can Liv-Regen still help me recover after surgery? "I have had my gall bladder out and struggle to digest fats which is a real problem during summer with all the extra socializing accompanied by rich and creamy food. I have been taking Liv Re-Gen for a fortnight in an effort to prepare for the onslaught which is easy to take, just one capsule during meals and really noticed a difference after a weekend away at a family wedding, indulging in previous forbidden foods (Cheese, mayonnaise, bacon, cream, coffee, cake etc) without the tiniest stomach pain. Thank you"
Can I take your products whilst I'm on other medication? Our products contain No Added Preservatives, No artificial colours, No flavourings, No dairy products, No gluten, No lactose, No soya, No sugar, No wheat No yeast and suitable for vegetarians. So should be okay to take, but if you want to be 100% sure just show the list of ingredients from our product page to your doctor. I have an existing medical condition or have had previous medical related surgeries are your products safe for me to take? How long should I take for? How long you take one of our products entirely depends on what you are taking them for. For example our bestselling product Liv-Re-Gen has a very wide range of users, some take because of poor gallbladder function where they feel bloated and struggle to digest food, some take to help recover after gallbladder surgery, some take to help with liver pain or to help with fatty liver disease or a more serious liver condition and some just use occasionally purely as a hangover cure after a long weekend. So how long you take entirely depends on your personal needs. I have difficulty swallowing capsules, how can I take to make it easier? Or can I open up the capsules and put it a glass of drink and consume? Although you can open the capsules and have with a drink, but this may cause heartburn or acid reflux as the multiple ingredients in its raw form will have to pass your lower chest area. A suggestion; if you have difficulty swallowing capsules is take a big bite of food, keep chewing until soft enough to swallow and just before you are about to swallow take the capsule in your mouth and swallow down with the soft food, then consume plenty of water. This should make it easier. Can I drink alcohol whilst I'm taking any of your products? 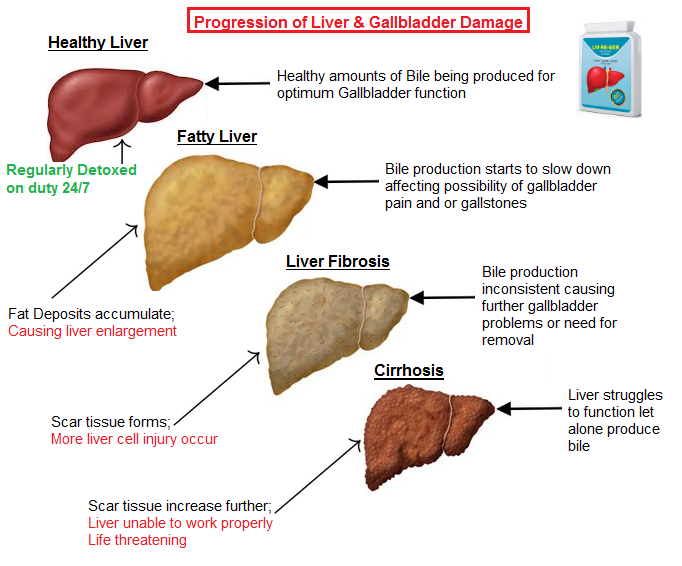 Firstly its important to understand that the liver when cared for by staying away from the things that are bad for it.... such as alcohol and instead delivering the right nutrients, herbs, vitamins and aminos on a daily basis for 120 days (4 month course) allows to firstly unclog and flush a congested liver and once this phase has been completed, then then second phase can begin that allows the liver to start repair and re-generate from any scar damage. A 30 day course can help start the cleansing process for a congested liver and gallbladder, if you have sluggish digestion, feel bloated and constipated this is the first thing it will help with by flushing a congested liver in order to increase bile production. During this time you can still drink alcohol but the benefits will be minimalized. A good analogy that we use to explain this concept is a car due that's for a service, you wouldn't take the car out and get on the motorway halfway through the service as this will reset any good work that's already been carried out, but rather you would wait for the service to finish. So again although you can have a drink, we wouldn't recommend it until you have completed at the very least a 30 day course in order to maximize the benefits. What is so good about Liv-Re-Gen? We'll let our customers respond to this question, please feel free to look at our good and bad real customer reviews for Liv Re-gen. click here >>> then scroll down to see reviews. How should I take Liv-Re-Gen? To get the most out of your Liv Re-gen, its best to take x1 capsule at a time x2 times per day, after or in between meals. So x1 capsule after morning breakfast or after lunch and x1 capsule after dinner. If however your organs are in mild pain around the liver and gallbladder area or you feel heavily congested take x3 capsules per day, x1 after breakfast, x1 after lunch and x1 after dinner. Do this until the pain resides and then gradually reduce to x2 capsules per day. We are based in the United Kingdom and all of our products are also manufactured and dispatched from here in the United kingdom. How much is postage and packaging to my country? UK & Ireland - Postage and Packaging within the UK & Ireland is FREE. Europe - Postage & Packaging using Tracked Recorded Delivery to any other country within Europe is FREE on Orders Over £60+ orders below £60 there is a small charge of £5. International Rest of the World - inc USA, Canada, Australia, New Zealand, UAE etc - Postage & Packaging using International Tracked Recorded Delivery is FREE on Orders Over £60+ orders below £60 there is a small charge of £8. I have another question not answered here? Please submit your question using our contact us page and we promise one of our team members will get back to you within 48hrs.